The Club occupies a large site on the Northern Boundary of Lower Delapre Park which we have held on a long lease from Northampton Borough Council since 1965. When we first occupied the site it was a boggy wilderness covered with scrub between the many mature trees. Since then the drainage has been improved and the undergrowth cleared from much of the site, though some has been retained as refuge for the abundant wild life. A large clubhouse, workshop, station building, ticket office and carriage shed have been built. Two main running tracks have been laid, one elevated for 3½ inch and 5 inch gauge locomotives and one at ground level for 5 inch and 7¼ inch gauge equipment. An elevated track accommodating 32 mm and 45 mm gauge railways is also available. We have a number of full-size LMS goods vans which are used for storage. 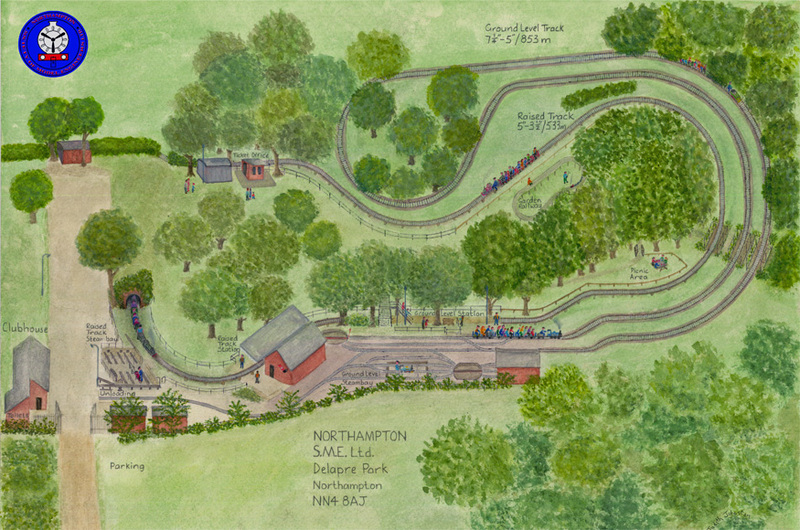 The Map of Delapre Site shows diagramatically the layout of the site and facilities. Both raised and ground level tracks were part of a development plan between 2006 and 2011, which extended them.